Microwave this pretty pillow for two minutes, then rest your head on its soothing warmth and lavender scent. This ambitious pillow aims to do more than just rest your head. It wants to soothe your jangled nerves, relax your muscles, and melt away the tensions of the day. Its pretty, 100% cotton exterior is filled with locally sourced barley and lavender, enabling it to achieve those goals. Pop it into the microwave for one to two minutes, and the barley radiates long-lasting, muscle-relaxing warmth, while the lavender calms your senses with its wonderful scent. Makes for some well-earned pampering at the end of a hard-working day. Made in Australia. Spot clean only. Leave on cool surface after use and do not put into storage until cold. Replace heat pillow after prolonged use or if it appears damaged. Discard if there is a burnt odor. Do not use on sensitive skin, infants or anyone sleeping. This smells wonderful! The heat lasts s a long time. I wish it was a little longer to wrap around the shoulders more. It lasts awhile and gets really warm. Smells great. 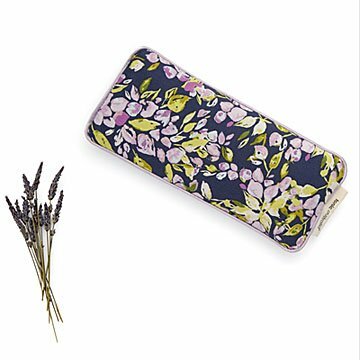 This is a great gift with a pretty scent and lovely pattern.